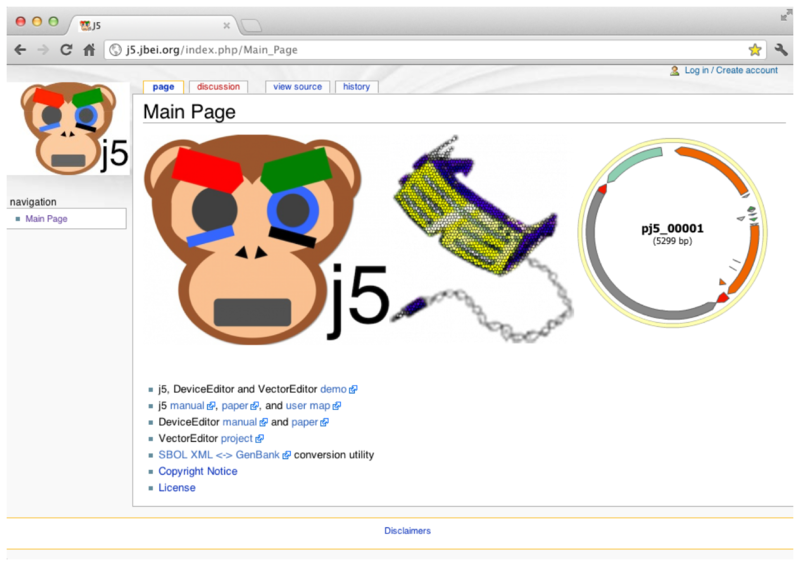 The j5 and DeviceEditor home page currently is located at https://j5.jbei.org. The simplified web interface for j5 DNA design assembly automation functionality is described on the previous page. 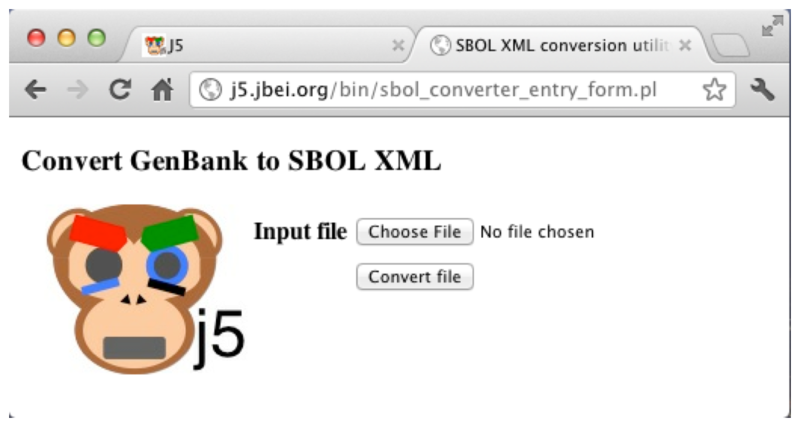 Here, we walk through the use of the simplified j5 SBOL XML <-> GenBank conversion utility web interface. 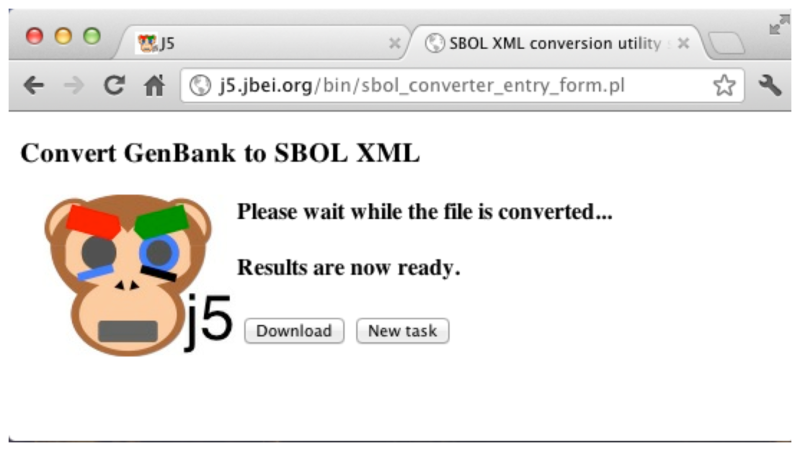 To continue on to the j5 SBOL XML <-> GenBank conversion utility web interface, click on the "SBOL XML <-> GenBank" conversion utility link. 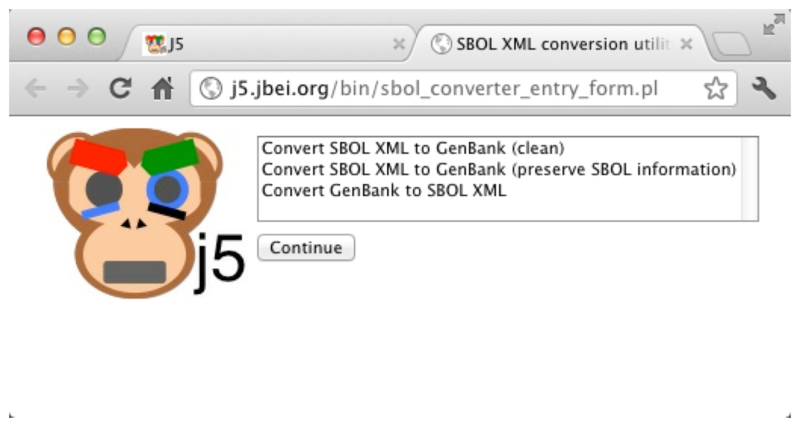 Click on the "Convert GenBank to SBOL XML" and press the "Continue" button. Upload the above file, and then click the "Convert file" button. To download the converted file, click the "Download" button. The name of the downloaded zip file will be of the form "j5_SBOLConverter_yearmonthdayhourminutesecond.zip" (e.g. "j5_SBOLConverter_20120618164238.zip" if the file was converted at 4:42PM (and 38 seconds) on June 18, 2012). The downloaded zip file contains the converted file along with the input file. The interface operates much in the same way for the other two options "Convert SBOL XML to GenBank (clean)" and "Convert SBOL XML to GenBank (preserve SBOL information)". As such, we won't explicitly go through them here. If you'd like, feel free to continue on as directed by the conversion of SBOL XML <-> GenBank sequence files example.